Writing in the Chicago Defender in 1948, Langston Hughes proclaimed, “If I were marooned on a desert island . . . I would miss . . . Jackie Ormes’s cute drawings.” As Nancy Goldstein notes, Hughes’ comments highlight the purpose of the “funny papers” in the Defender and other papers because they exist amidst distressing headlines and provide a space for readers “to savor the conflicts and triumphs depicted by the papers’ black cartoonists.” Goldstein’s comments perfectly describe Jackie Ormes’s Patty-Jo ‘n’ Ginger, a one-panel comic gag that she began writing for the Pittsburgh Courier in 1945. 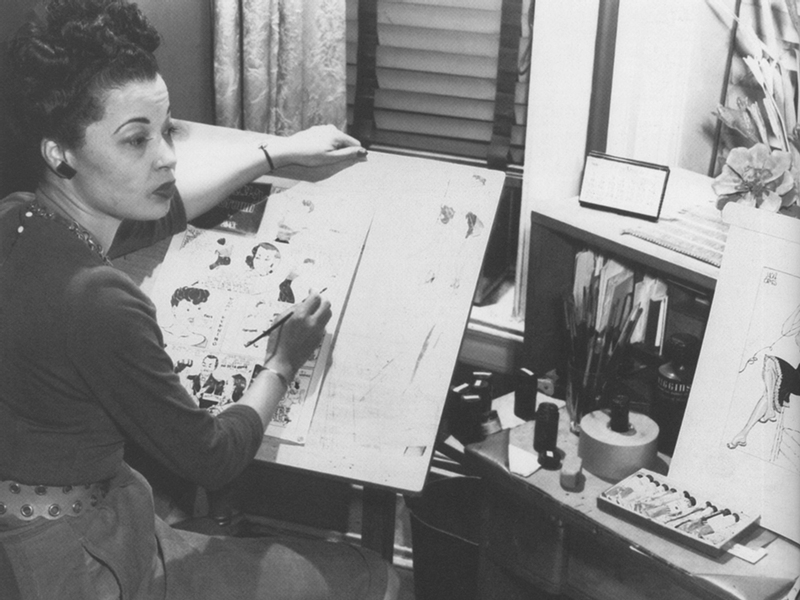 Over the course of her career, Jackie Zelda Ormes produced four comics for Black newspapers such as the Pittsburgh Courier and the Chicago Defender. Continually hitting up against the journalistic glass ceiling in the early to mid-1900s, Ormes, alongside her newspaper pieces on fashion, sports, and other topics, penned comics that tackled the political and social issues facing Black Americans, and especially Black women, during the period. These comics included the migration-themed Torchy Brown (1937-1938), the domestic Candy (1945), the middle-class sisters Patty-Jo ‘n’ Ginger (1945-1956) and romance themes with Torchy Brown: Heartbeats (1950-1954). Patty-Jo ‘n’ Ginger ran from the end of World War II through the beginning of the modern Civil Rights Movement. In the comic, Ormes provided social commentary on a wide range of contemporary issues, including segregation, housing discrimination, and education. Within each gag, Patty-Jo, “a precocious and witty little girl,” provided the commentary as she spoke to “her attractive big sister.” This set up led some, as Goldstein notes, to overlook “the cartoon’s polemical commentary” as nothing more than “children’s fare or somehow frivolous in content.” However, there is a need to reappraise Patty-Jo ‘n’ Ginger because in the span of each panel Ormes’ voice rises to address how events such as McCarthyism and the murder of Emmett Till affected Black Americans. 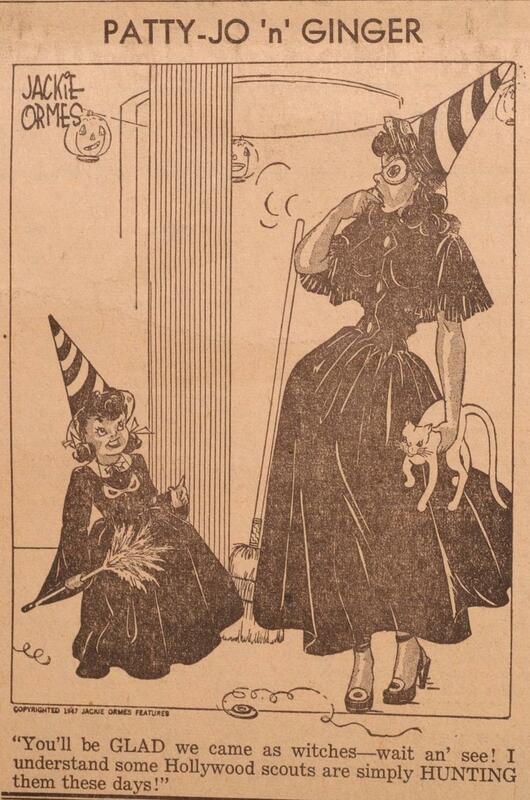 Ormes’ November 1, 1947, gag depicts Patty-Jo and Ginger dressed up as witches for Halloween. Ginger carries a white cat and has her hand to her mouth as Patty-Jo says, “You’ll be GLAD we came as witches—wait an’ see! I understand some Hollywood scouts are simply HUNTING them these days!” The connotation here, of course, calls to mind Joseph McCarthy and the House Un-American Activities Committee which sought to identify communist members or sympathizers and essentially blackball them from whatever business they worked within. Hollywood became a major target, and actors such as Paul Robeson got called before the committee. In her book, Black Women in Sequence, Deborah Whaley notes that “Ginger’s reaction to Patty-Jo confirms the fearlessness and danger in Patty-Jo’s inadvertent innuendo, and indeed, such signifyin(g) commentary, even in comic form, garnered unsmiling notice from the FBI.” The agency ran a file on Ormes between 1948 to 1958; however, they may have been watching Ormes earlier. 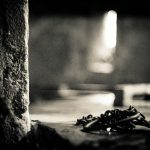 They would track her steps, following her to the bookstore and other places to gather information on her possible connections to the Communist Party. 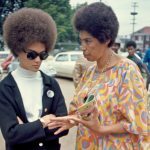 They even interviewed Ormes on several occasions and eventually her file totaled 287 pages, 150 more than the file on Jackie Robinson. The October 8, 1955, panel highlights Whaley’s assertion about Patty-Jo. Appearing a few days after a jury in Mississippi found Roy Bryant and J. W. Milam “not guilty” of the kidnapping and murder of Emmett Till, the image shows Patty-Jo and Ginger in what appears to be a middle-class dwelling. 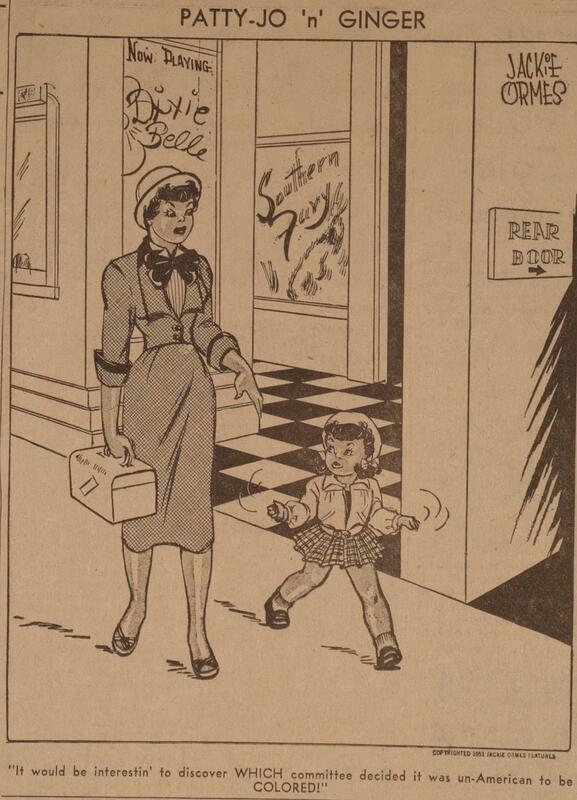 Patty-Jo stands next to an open door with an emphatic expression on her face as Ginger looks at the young girl with a somewhat astonished look while holding a newspaper behind her back. If the paper contains information on Till’s murder and the trial, it is interesting that Ginger appears to hide the paper from the young Patty-Jo. Patty-Jo looks at Ginger, saying, “I don’t want to seem touchy on the subject . . . but, that new little white tea-kettle just whistled at me!” The statement, coming on the heels of the “not guilty” verdict for Bryant and Milam, takes what on the surface appears to be an innocuous event (the tea-kettle whistling) and subverts it with the adjective “white” and Patty-Jo’s qualifying that she does not “want to seem touchy.” Patty-Jo’s comment contains varying semiotic webs. Ultimately, it shows the double standard of white women being held up as pillars of virtue, virginity, and submissiveness and Black women being seen as nothing more than sexual beings. 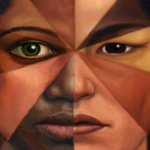 These images, of course, reside(d) within myths and stereotypes about both Black and white women. 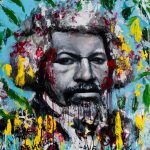 The fourteen-year-old Till was accused of whistling at a white woman (a charge that has since proven false), and was later kidnapped, beaten, and killed by a group of white men. His death occurred for no other reason than his encounter with a white woman store clerk. Through the reversal of the whistle, Ormes highlights the fact that Patty-Jo, as a young, Black girl, feels the same sort of emotions as Carolyn Bryant. However, because she is Black, whites expect her to appreciate the attention and even succumb to the advances of white men. As the poem progresses, the “Fine Prince” becomes the villain, and the “maid” realizes this when her husband corrects the children at the dinner table. She begins to see the blood of the “Dark Villain” on him, and she becomes scared to touch him. However, at the end of the poem, her husband takes her in in his arms, and she does not struggle. Instead, she succumbs to his advances, all the while thinking about the atrocities that he perpetrated and Mamie Till’s eyes. We must remember that it is Patty-Jo, not Ginger, that makes the comments in Ormes’ panels. Through this positioning, Patty-Jo served as a role model for younger readers, showing that their voices and experiences matter. Beyond the pages of the Pittsburgh Courier, Patty-Jo provided a representative option for young Black girls in the form of a doll they could buy and play with. While the doll’s production only ran from 1947 to 1949, the mere appearance of a Patty-Jo “gave young Black girls representative options” among the myriad of stereotypical dolls depicting mammies and Topsy caricatures. Patty-Jo ‘n’ Ginger’s importance exists on varying levels. Ormes’ gag openly challenged segregation and discrimination. Importantly, she also presented readers, especially young Black readers, with representations of themselves that countered the stereotypical images in popular media. As such, we cannot dismiss Patty-Jo ‘n’ Ginger as mere “children’s fare.” Even though Patty-Jo’s comments reside behind simple language, the issues they addressed were far from simple. 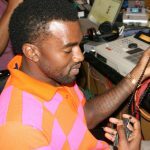 To the contrary, they offered crucial social commentary and insights on Black life during the twentieth century.